San Antonio is the second-largest city in the state of Texas. 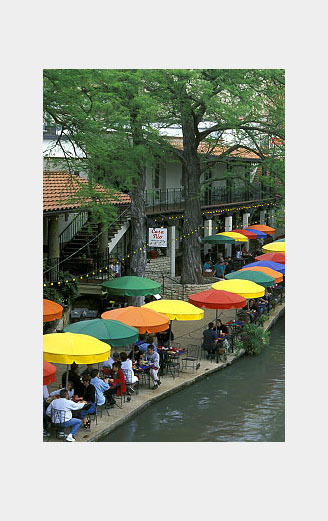 Located in the northern part of South Texas, San Antonio is a cultural gateway into the American Southwest. San Antonio is the seat of Bexar County with a population just under 1.3 million as of the 2006 U.S. Census estimate, as well as the 4th fastest growing large city in the nation from 2000-2006 . San Antonio's metropolitan area has a population of over 1.9 million and San Antonio is the 29th-largest metropolitan area in the U.S.
San Antonio was named for the Italian Saint Anthony of Padua, whose feast day it was (June 13) when a Spanish expedition stopped in the area in 1691. San Antonio has a strong military presence—San Antonio is home to Fort Sam Houston, Lackland Air Force Base, Randolph Air Force Base, and Brooks City-Base, with Camp Bullis and Camp Stanley right outside the city. San Antonio is home to the South Texas Medical Center, the largest and only medical research and care provider in the South Texas region. San Antonio is famous for its River Walk, the Alamo, Tejano culture, and home to the Sea World San Antonio and Six Flags Fiesta Texas theme parks, San Antonio is visited by 20 million tourists per year. San Antonio is also home to the first museum of modern art in Texas—the Marion Koogler Mc Nay Art Museum, as well as one of the most successful National Basketball Association teams in league history, the San Antonio Spurs. Riverwalk (pictured to the right). Market Square is filled with various activity.